As many of you who tracked this storm with me, the EURO performed absolutely horribly. It was announced today, ironically, this model will receive a major upgrade on June 5th to both the operational and ensemble guidance. I never place 100% confidence in any model but the EURO, around the time of Hurricane Sandy, was deadly. It nailed storm system after storm system. One of the things that has been talked about recently on the board is solar activity. Does the Euro, or any model for that matter, factor such things into its forecasts or is it strictly information gather from satellites, weather balloons, etc? You just said the magic words, now it will be the worst model to ever run! Idk if you noticed, but every model that has been upgraded, *ASIDE FROM THE NAM*, has gotten worse. MUCH worse. Well, I think the argument can be made that the GEM/CMC has been pretty darn good at spotting medium range threats with relative track accuracy, but then goes belly up inside of five days lol but other than that, I think these upgrades are having an inverse effect on the modeling. Why? Increases in things such as resolution, vertical scale, and attempts at more refined parameterizations, exponentially increase the amount of calculations that must be performed. As we see with high-resolution/short-range guidance all the time, errors begin running rampant much more rapidly as they propagate and grow through each subsequent calculation. Global models are global for a reason. By definition they are not designed to produce output on the scale of a kilometer, or few kilometers, and anybody who thinks they were designed for that is nuts. I'm not saying upgrades are a bad thing, don't misunderstand, but think there has been a chase to produce the prettiest maps, instead of chasing the improvement of what they were designed for. The EURO's last update a few years ago added increased vertical scope and resolution, and ever since then we have seen it perform much worse than it had previously. My mentality is if it isn't broken, don't fix it. They had a great thing, and why they changed it is beyond me. The UKMET is also slated for upgrades in the time coming, so we will have to see how that adjusts. The GFS is the GFS; I think it will always have good and bad days, biased toward bad (lol), but I think it would really drastically improve its performance if they TOOK THE TIME AND FIXED ITS TROPICAL COMPONENTS (tropical convective modes, heat release parameterizations, etc.). That would be huge!!! But, who am I/are we?? We are just the lowly peasants who use these things and STILL outperform any mainstream organization in the time-mean, so what do we know? but, in all, I think the NAM, as much as it was scoffed at, yet again won the battle of the upper-levels. It was the closest with how it depicted the overall evolution, and yet again, further substantiates my opinion that it is the best model in its temporal range, bar none, over the last few years. Whatever they did to it, IT WORKED. What about the new satellite they just launched for weather modelling? Has it had any affect on the recent storm modelling? rb924119 wrote: Idk if you noticed, but every model that has been upgraded, *ASIDE FROM THE NAM*, has gotten worse. MUCH worse. Well, I think the argument can be made that the GEM/CMC has been pretty darn good at spotting medium range threats with relative track accuracy, but then goes belly up inside of five days lol but other than that, I think these upgrades are having an inverse effect on the modeling. Why? Increases in things such as resolution, vertical scale, and attempts at more refined parameterizations, exponentially increase the amount of calculations that must be performed. As we see with high-resolution/short-range guidance all the time, errors begin running rampant much more rapidly as they propagate and grow through each subsequent calculation. Global models are global for a reason. By definition they are not designed to produce output on the scale of a kilometer, or few kilometers, and anybody who thinks they were designed for that is nuts. I'm not saying upgrades are a bad thing, don't misunderstand, but think there has been a chase to produce the prettiest maps, instead of chasing the improvement of what they were designed for. The EURO's last update a few years ago added increased vertical scope and resolution, and ever since then we have seen it perform much worse than it had previously. My mentality is if it isn't broken, don't fix it. They had a great thing, and why they changed it is beyond me. The UKMET is also slated for upgrades in the time coming, so we will have to see how that adjusts. The GFS is the GFS; I think it will always have good and bad days, biased toward bad (lol), but I think it would really drastically improve its performance if they TOOK THE TIME AND FIXED ITS TROPICAL COMPONENTS (tropical convective modes, heat release parameterizations, etc.). That would be huge!!! But, who am I/are we?? We are just the lowly peasants who use these things and STILL outperform any mainstream organization in the time-mean, so what do we know? but, in all, I think the NAM, as much as it was scoffed at, yet again won the battle of the upper-levels. It was the closest with how it depicted the overall evolution, and yet again, further substantiates my opinion that it is the best model in its temporal range, bar none, over the last few years. Whatever they did to it, IT WORKED. I think if it ain't broke, don't fix it is one of the best adages of all time.As in the Financial World, where Warren Buffet warns 'beware of geeks bearing formulas", intellectuals in the realm of meteorological modeling have to justify their existence and tamper and tinker to try and "improve" the end product.we saw what financial tinkering with the tried and true banking system of the 1950's and 1960's did to the economy in 2008, totally collapse it.I won't be so sanguine to put the meteorologists who design and alter the models in that category, but they did screw up the Euro as you describe.From my limited understanding, the only thing I can say is that there are probably so many variables to contend with in the writing of the computer code for these models, that so many interpretations at different times from different models occur.How you, Frank, Doc, Al, Mugs and any others I miss can "read the tea leaves" at all suggests that there is enough there so as to "see through a glass darkly" and make a damn good forecast.Maybe as time goes on these variables will be analyzed and understood to a degree where the models efficiency will increase greatly. I agree and disagree at the same time. I feel we are in a transition era, one where we have the research and basis to improve NWP however at the same time lack the needed computing power to meet these needs. We do lack in MPP and CP department. I feel a lot of what we use today is antiquated and outdated and can be improve. The ECMWF still has the best initialization and ensemble breeding techniques. Ours is outdated and inadequate. However, were we do divide on opinion is when you begin to state that increased VR and HR has eliminated skill from the Euro. I am not sure I whole agree with the "If it ain't broke, dont fix it technique". Pushing the boundaries of forecasting and NWP technology is how we improve forecasting. Human interpretation will always be better than standard NWP guidance due to individual learning and recognition of bias's etc. See Bosart(2003), and a few more papers. I feel the way we may calculate skill subjectively may differentiate how others subjectively calculate skill in other parts of the world (ex. EURO may have been poor on EC cyclogenesis but may be even more skillful on lee-side cyclogenesis down south etc etc.). Still, using the standard 500mb skill, the ECMWF HRES is better then it was before the upgrade. We are at the point where we are pushing the limits of skill on NWP. The only way we can truly get better is incremental improvements and eliminating "drop outs" in NWP forecasts. We are limited by our assumptions and simplifications of the atmosphere and the physical means behind them (etc etc) as you know. Getting back to the point. We still have room for improvement in NWP, a great example you gave is the GFS poor TC algorithm. It is equally as poor as the GEM, and maybe the non-coupled HWRF. This will be improved and with that, NWP. Now making adjustments to NWP in the short term can subjectively degrade skill in certain regions on short temporal timescales ( I honestly do not think the Euro has done such a poor job as everyone makes it out do be, we are talking about mesoscale phenomenon's that have impacted the last few systems that with the resolution of the ECMWF HRES, it can not resolve anyway. We should know the limitations of certain NWP, hence why we have focused in on HI-RES grided guidance of late). However, I think it is a good assumption to note ECMWF acknowledges this issue and will have a fix for it one way or another. Anyway, it still a good discussion to have. Carry on. The hi res models like the NAM and also the RGEM did much better at resolving the QPF and snow totals. I can tell you for the upcoming event if the euro locks in on a track of the 500mb features, esp if its a closed low at that level, I will use that as guidance as to where the axis of heaviest snows will fall, and look for what sorts of QPF amounts are being modeled by the hi res models in tight to make a prediction. It seems to me in the past we had snowstorms that would come through with relatively uniform rates that would affect us all pretty uniformly. The past few years the storms seem to have had more explosive dynamics. I may be wrong here but I think all models have struggled mightily. Yes the once great EURO has been a train wreck but they all have. I’m more curious about why the storms themselves are so difficult to pin down. Maybe I’m totally wrong but it used to be track A equals this solution track B equals that. Which one will be right. Sroc- are you sure the Euro nailed the 500 mb track or was the track in the mid point of the NAM and the Euro? Seemed to me the 500 mb was a bit closer to the coast when looking at the SPC meso analysis when the storm was happening. Also , we forget about the 700 mb track which was north of the 500 mb and slide off the Delaware coast. Bernie Rayno was saying that it would be tough to get 12 in in NYC with the forecast track of the 500 mb low on the Euro but definitely NYC could see that much with the track of the 500 mb on the NAM. Many portions Staten Island , Queens and Brooklyn did see 12 in amounts. The only reason I am mentioning this is that I was following the Meso Scale maps , hour by hour. WeatherBob wrote: Sroc- are you sure the Euro nailed the 500 mb track or was the track in the mid point of the NAM and the Euro? Seemed to me the 500 mb was a bit closer to the coast when looking at the SPC meso analysis when the storm was happening. 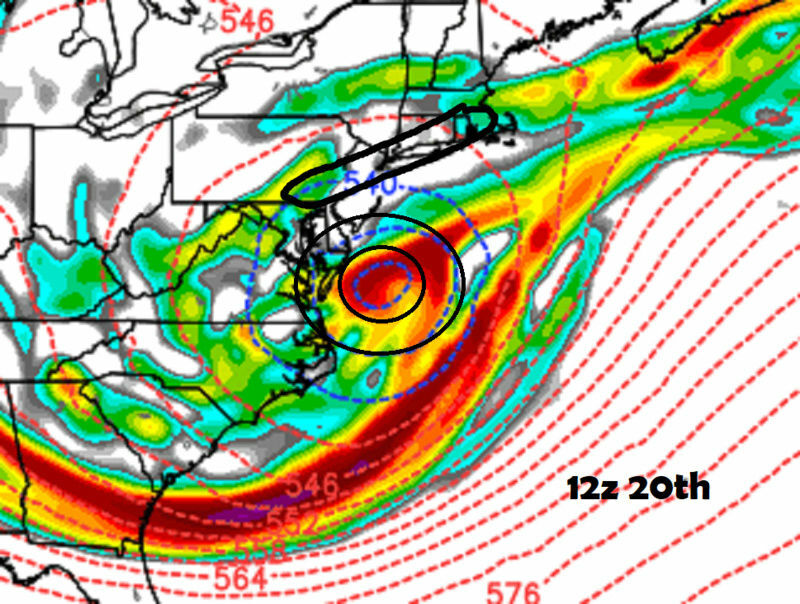 Also , we forget about the 700 mb track which was north of the 500 mb and slide off the Delaware coast. As was I. It will be interesting to see the reanalysis of the 500mb to see the actual track and strength and compare it to the two models. Maybe your right about that but my eye I thought it looked much closer to the euro track in general. Great points however on the 700mb low because I paid less attention to it on the models but was also following almost hourly on the real time meso scale maps. It is a matter of interpretation when u look at those maps. I may look at a map and say the circulation center is at point A. You might look at it and say the circulation center is at point B which could be say 30 or 40 miles away. 30 to 40 miles is a big deal when we are talking about where the heaviest snow will fall in the Tri State area. It just seemed that the radar loop from Dover Delaware showed the circulation center closer to the coast when the 500 mb low swallowed the 700 mb low. Gotta love the real time data we have these days. There was basically no real time data when I became a meteorologist besides a crude static radar picture and surface obs. 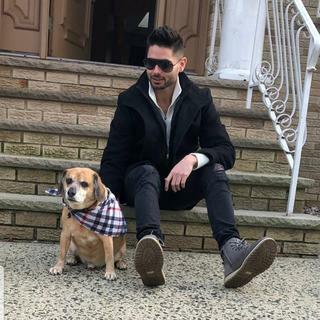 Oh yeah, and I forgot Cousin Vinnie that lives outside of Philly, just called him and he said it’s snowing like he has never saw. I am serious. Sroc- I looked back on tropical tidbits to the 18z NAM 12km. Looks like the 500 mb lows are about the same position and movement to the Euro. The key was the 700 mb low on the NAM . It shows the circulation center moving off the Delaware coast and then moving ENE which is what the meso maps were showing. You can see later in the frames the two bands of VV. The big one cutting thru LI and then that other one that developed from the LHV SSW into NNJ. I think the NAM performed better than the Euro in my opinion.